Dobey: "It was a dream come true to play in front of that crowd tonight, I felt like Alan Shearer at one point!" Local favourite Chris Dobey said he felt like Alan Shearer playing in front a spine-tingling atmosphere at the Utilita Arena in Newcastle on Thursday night. Dobey, the first 'Contender' to replace the injured Gary Anderson in the Premier League, blew a 5-1 lead before holding his nerve at the death to salvage a 6-6 draw with Mensur Suljovic. Grand Slam of Darts quarter-finalist Dobey's debut got off to a dream start as he won five of the opening six legs, landing a 113 finish in the first of them. 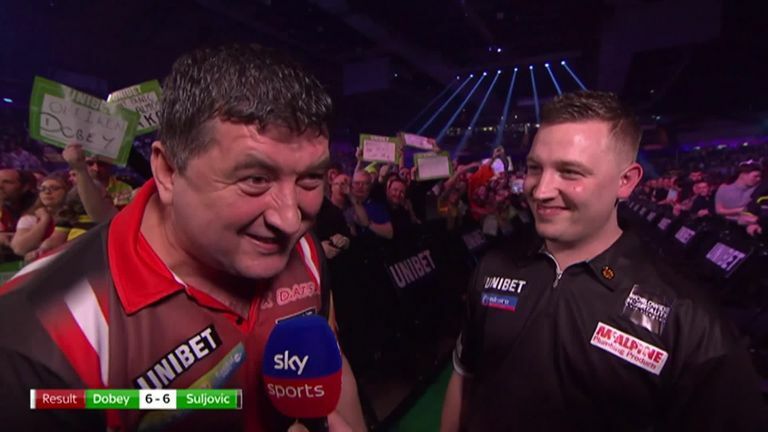 World Matchplay finalist Suljovic battled back, winning five successive legs to go within a leg of victory, only for Dobey to find a crucial double 16 with his last dart in hand to ensure the roller-coaster tie would end in a draw. "It was a dream come true to play in front of that crowd tonight, I felt like Alan Shearer at one point!" said 28-year-old Dobey. "If it wasn't for the fans spurring me on I could've easily thrown that one away and it was a great feeling to get the draw in the end. "This was an amazing opportunity and now I want more of this, which means putting the hard work in on the ProTour and hopefully more chances will come for me in the future."